Motherwell FC is today delighted to confirm the appointment of James McFadden as Assistant Manager. Following Stephen Robinson’s move to Oldham Athletic a few weeks ago, the club has been looking for a replacement. And ‘Well boss Mark McGhee has made his mind up, appointing the 33-year old former Scotland legend, who is currently progressing through his coaching badges with the Scottish FA. Faddy, who has signed a deal until the end of the current season, will also still register as a player. Speaking of his new assistant, McGhee said: “I am delighted James has taken the role as I think he has fabulous qualities to be an Assistant. “He has played at the highest level, worked with some tremendous coaches and any time you speak to him, you can appreciate he has a deep understanding of the game. McFadden added: “When I spoke with the manager about taking the role, I started to get excited about what we could achieve. “Everyone knows I love the club and will work as hard as I possibly can to make a success of things. “It’s something new and it’ll be a change for me, but it’s an exciting one and one I think I can handle. The Steelmen play host to East Stirlingshire in the BetFred League Cup on Tuesday night, looking to record a second consecutive victory in the competition. Mark McGhee’s men go in to the third Group F fixture on the back of a convincing 3-1 win away to Annan Athletic. Despite the Shire’s recent fall to non-league football; McGhee is not taking the fixture lightly, as his side strive to qualify for the knockout stages of the competition. One of the major boosts for the ‘Well boss is the recent form of striker Louis Moult, who is set to undergo surgery on an injury. The Englishman featured against Annan and bagged a brace and lasted the entire 90 minutes. And with Tuesday’s visitors under new management in John Sludden, the Fir Parkers will hope for a similar result to take their points tally to 6. Lee Lucas, who featured as a trialist against Annan, will hope to recover from the knock that saw him leave the field after half an hour. Star attacker Marvin Johnson, who dazzled against the League Two side on Saturday, will look to continue his fine form after registering two assists and scoring a wonder goal. Defensively, the Steelmen looked solid against Annan, with new signing Ben Heneghan the player to watch as his game goes from strength to strength with every passing match day. With the Shire yet to pick up a point in Group F, it hasn’t been an easy start for their new manager. But with the clubs sights aimed at returning to the competitive leagues, the underdogs will be out to prove themselves against Mark McGhee’s side, in what is set to be an interesting League Cup clash. Having impressed already during his short time with the Fir Parkers, centre-back Ben Heneghan will be hoping to continue his fine form under Mark McGhee’s tutelage. The 22-year-old, who joined from National League side Chester, has slotted seamlessly alongside Stephen McManus at the heart of the ‘Well defence. Standing at 6ft 4in, the Englishman has demonstrated natural aerial dominance, as well as a relaxed, confident presence with the ball at his feet. The defender, who has represented England at youth level, is not only a coup for this season, but for the future of the club. At just 22, Heneghan admits he is learning from the experience of McManus and the challenge of sides like Rangers. He said: “I’ve played in the two cup games so far – the Rangers game was a very good tempo which was a step-up for me and then against Annan the other day was another good game. As well as his performances on the pitch, Heneghan added that he has settled well off it too. 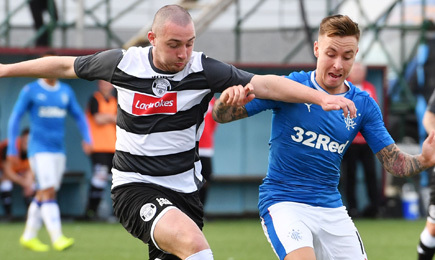 East Stirlingshire travel to Fir Park on the back of a 3-0 defeat at home to Rangers. That result came following a 3-1 defeat to Stranraer, leaving the club at the foot of Group F.
But the Shire, like Motherwell, have played one game fewer than table toppers Rangers and will be looking to kick-start their League Cup campaign with their first victory tomorrow night. The side also come into the fixture under new management, as well as no longer holding their competitive league status. John Sludden was appointed as manager in the summer, following the clubs relegation to the Lowland League. He comes in to the role alongside assistant Martin Mooney, and together the two are faced with the task of returning the club to the top tiers of the Scottish game. Last season was one of the toughest for the fans to bear in their clubs history – being relegated from the top flights of Scottish football for the first time since 1955. But there are some similarities between East Stirlingshire and the Steelmen. One of the glaring similarities was the Shire’s old stadium name: Firs Park. However, they left their ground eight years ago, and now share with Stenhousemuir; another similarity, as Motherwell have previous experience after ground sharing with Gretna in 2007. The Shire face some rebuilding though, having lost both David McKenna and Max Wright to their Group F opponents Annan – with the two sides facing each other on Saturday. One of the other losses for the club came in the form of young, promising right-back Ross Gilmour. The 22-year-old made the switch to League One outfit Albion Rovers having arrived at East Stirling from the U20s set-up at Dundee United. With a number of new faces arriving at the Shire though, the club will be hopeful of bouncing back into League Two. 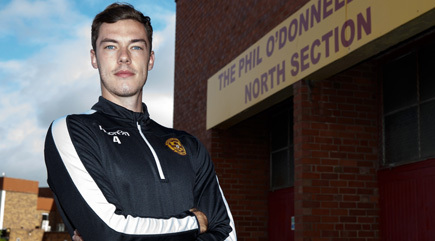 Summer signing Ben Heneghan admitted he has settled in quicker than he thought he would at Fir Park. The 6ft 4 inch centre defender signed after two successful years at National League side Chester, and has impressed manager Mark McGhee and Motherwell fans in his first appearances in Claret and Amber. Speaking to the press today, the 22-year-old spoke of the warm-welcome he’s received from everyone at Motherwell FC. In terms of his performances, Heneghan has already gained his plaudits and has settled in to Mark McGhee’s back line extremely well. Having partnered Stephen McManus so far, the young defender feels he has gained valuable experience already. Heneghan spoke of tomorrow night’s fixture against East Stirling, adding that the team need to carry the attitude from the Annan victory in to the third group match. ‘Well boss Mark McGhee today admitted his players fitness may be affected by the League Cup ahead of the new season, as he is restricted to how hard he can work the squad. Speaking to the press this morning at Fir Park, the manager outlined what he believed to be the impacts of summer football on his pre-season preparations. He said: “There’s pro’s and con’s to the League Cup, and I think one of the con’s is that last Thursday when we would’ve had two sessions, we only had one because we had a competitive game coming up. “We didn’t want to risk leaving the boys short of legs, whereas if we were playing a friendly on Saturday we would’ve worked them hard on Thursday twice. McGhee addressed the injury concerns surrounding his squad, after trialist Lee Lucas limped off after half an hour against Annan during the 3-1 win on Saturday. But there are positives for the Fir Parkers, who will be boosted by the return of star striker Scott McDonald. Referee for Tuesday’s Betfred Cup clash with East Stirlingshire at Fir Park is Craig Charleston. It will be Craig’s first ‘Well match of the season and only his fourth ever appointment in charge of the Steelmen. The last was back in September 2014, a 1-1 draw with Hamilton in the same competition, a game that Accies eventually progressed through on penalties. Previous to that was at Fir Park, when the Claret & Amber men edged out Kilmarnock 2-1 August 2013. A Stephen McManus OG gave the Ayrshire side the lead but goals from Henri Anier and John Sutton handed the then Stuart McCall led Motherwell all three points. The only other ‘Well appointment was back in February 2012 – a dull and forgetful 0-0 draw with St Mirren in Paisley. Both Ivan Stankovic and Kevin McElhinney will assist Craig on the night. Motherwell host East Stirlingshire at Fir Park this Tuesday, 7.45pm kick off and hospitality is available to all supporters in our Centenary Suite. Arrival from 5.30pm, supporters can enjoy a two course Indian meal in the comfort of our Centenary Suite then take their seats in the Phil O’Donnell stand to watch the League Cup match. An Amber package is priced at £55 which includes the meal, drinks pre & post-match match, ticket to watch the game, programme and half-time refreshments. The Claret package, £35, provides access to a pay-bar, your meal, match ticket and half-time refreshments too. Should you wish to take the game in, and visit the Centenary Suite only for half-time refreshments a ticket is priced £25 for adults with £20 for a concession ticket and Juvenile £10. Highlights from Galabank Stadium as goals from Marvin Johnson and a Louis Moult double seals a 1-3 win for the Steelmen. Action images from today’s 1-3 win over Annan Athletic in the Betfred Cup. ‘Well boss Mark McGhee was impressed with the performance from every player on the park today – as his side dominated in a 3-1 win over Annan Athletic. Speaking to MFC TV, McGhee praised his squad on their work rate and team-work, in what was an extremely positive display from the Steelmen. Last season’s top scorer Louis Moult bagged a brace, but such was the high standard of performance that it was team-mate Marvin Johnson who claimed the man of the match award. But McGhee said: “I thought everyone was excellent today. Marvin gets that sort of attention with the way he plays, taking on players and driving forward, but defensively we were brilliant too. “I thought Lionel worked hard for the team and did really well and Stevie Hammell pushed Marvin close for Man of the Match, in my opinion. With such a positive feeling around Mark McGhee’s squad, he spoke of the importance of the three points. The Fir Parkers host East Stirlingshire on Tuesday in their third match in the Betfred Cup in group F.
With three points wrapped up today, McGhee is looking ahead to the next competitive fixture with confidence as the squad’s pre-season preparations are starting to click.